If the phrase “pigs in a blanket” conjures up images of darling newborn piglets swaddled in warm fluffy blankets you are definitely not a foodie. National Pigs in a Blanket Day on April 24 is a holiday celebrating one of our favorite comfort foods — pork sausage (or hotdogs) baked in pastry. And whom shall we thank for all this? Start with Betty Crocker, whose cookbooks decorated every post-war kitchen — exposing young impressionable minds to this culinary delight. In 1957 she published Betty Crocker’s Cooking for Kids, with the first simple recipe for the taste treat, and the rest is history! From a child’s first flour-smudged attempts at cooking to chic cocktail party fare, and from fancy pastry crust to pre-made biscuits in a tube, pigs in a blanket are the ubiquitous snack for every occasion. 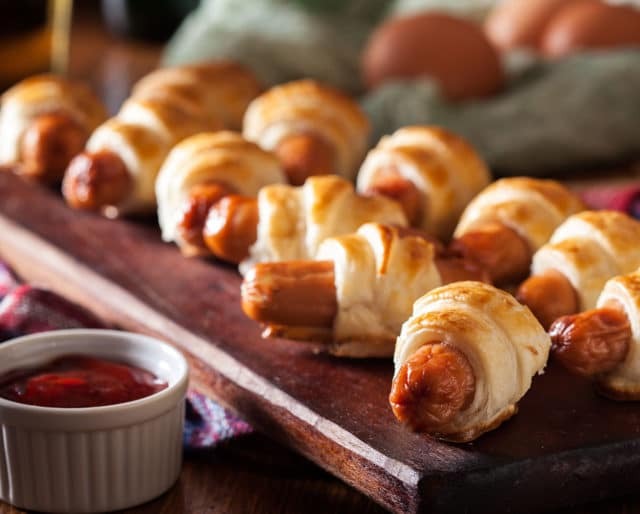 Whether it’s a plain hotdog or a fancy sausage wrapped in your favorite dough, gather your friends and share memories of the first time you were introduced to pigs in a blanket. Take a moment to call, or better yet – write a note – to the one you think of first when you think of eating pigs in a blanket. Get all the ingredients together for all the different recipes you can think of — hot dogs, savory sausage, breakfast links —even some vegetables like asparagus or baby carrots for your vegetarian friends. Then make pancakes and buy puff pastry, soft tacos, wonton wrappers, even a tube of biscuits — and invite your friends over. Make it a candlelit dinner and surprise your guests with this unusual entree. They're a creative and fun way to foster a love of cooking in kids. For the first batch, set a good example about the importance of following a recipe. Then show them how to break all the rules and still create a great snack. A warm treat for your guests! They’re easy to make and very tasty. With just two ingredients, all you need to do is add friends (and drinks) and you've got a party! Foods trigger memories. Pigs in a blanket remind us of being kids, making these tasty treats with our parents, getting giddy as the delicious aroma started to waft from the oven, then waiting impatiently as they cooled down enough to eat!